A chocolate Covered Pretzels Recipe is just for you, if you love the sweet and salty taste combination of chocolate and pretzels. You can choose from an array of designs that will make your mouth water long before you take the first bite. You can make your own homemade chocolate covered pretzels. It is as easy as can be. You can keep it simple and prepare basic pretzels dipped in chocolate, or you can get as elaborate as you like. Melt chocolate and shortening in double boiler over medium heat, stirring until smooth. If you would rather, you can do your melting in the microwave, just be sure to stir every 30 seconds and do not overheat. Allow to cool slightly. Dip pretzels in chocolate and place on waxed paper covered trays to set. Chill if necessary. If you want to really indulge yourself, dip pretzels in or sprinkle with crushed nuts, coconut, or sprinkles before the chocolate sets. Yumm! Alternately, you may want to get fancy and drizzle a contrasting chocolate across your pretzels to really make them look spectacular. 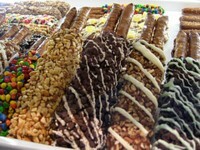 You may also want to try making chocolate dipped pretzel rods. They make wonderful party favors and treats. If you want to go all out and treat yourself or someone you love to some Gorgeous Gourmet Chocolate Covered Pretzels, you will find them at online. The prices really aren't too bad, so they make lovely gifts. 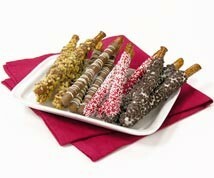 You can even order bulk chocolate covered pretzels if you want to use them for a party or special event. They'd make a memorable party favor!